Guwahati, Mar 25 : Pro-democracy Myanmar politicians feel that a full-fledged democracy in their country is essential to promote economic and cultural ties with the northeast. During a consultation programme on 'Peace and Human Rights in Burma' at Lamka in Manipur's Churachandpur district on Saturday, Myanmar's former National League for Democracy (NLD) parliamentarian, Tint Swe, said that ethnic groups in the northeast should actively come forward to help establish proper democracy in the neighbouring country. The programme was organized by the Burma Centre Delhi (BCD) and hosted by the Zomi Human Rights Foundation (ZHRF). BCD coordinator Alana Golmei said that many ethnic groups common to Myanmar and the northeast are divided by the political boundary between the two countries. 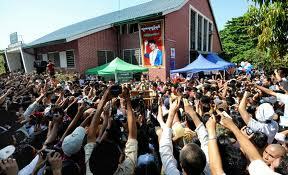 Golmei said that full-fledged democracy in Myanmar is a necessity for promoting closer relations between these groups. "There are many ethnic groups that reside on both sides of the border. A full-fledged democracy in Burma is essential so that the divided groups can revive their connection. We are trying to promote consultations between ethnic groups on both sides of the border to help democracy in the neighbouring country," Golmei said. In the consultation programme at Lamka, Zomi people from both sides of the border took part. Last year, there were similar consultations between the Nagas and other ethnic groups. Swe emphasized the necessity of physical and mental connectivity between India's northeast and Myanmar for better cooperation between the two sides, adding that the connectivity is still in a nascent stage. Myanmar's Naga National League for Democracy chairman U Saw Sa said that even though there have been political improvements, people there were still skeptical about the military-headed government. He added that the military-backed constitution still exists and that for a real democratic change, it should be drafted according to the people's mandate. NE-based Indigenous People's Human Rights Defender (IPHRD)'s Suanmoi Guite highlighted the plight of ethnic minorities living in Myanmar, especially in the Chin state. Guite said that health, education and other basic facilities are a far cry for these people. He added that for these ethnic minorities, like the Zo people, it is easier to have access to healthcare facilities in Manipur's Churachandpur rather than traveling long distance to Rangoon.